Large perfume bottle. Made by Foster & Bailey, C 1920. Bell-form crystal bottle with etched foliage and cut geometric ornament. Sterling silver stopper with dagger-form crystal plug. 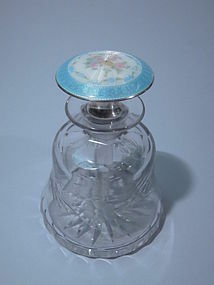 Stopper top has pink and blue flowers on white and blue ground in guilloché enamel. For your favorite scent. Stopper hallmarked. Surface wear to bottle underside. Otherwise very good condition.